His thoughts is a Neutral card. It is the card of thinking, but also the card of creativity. 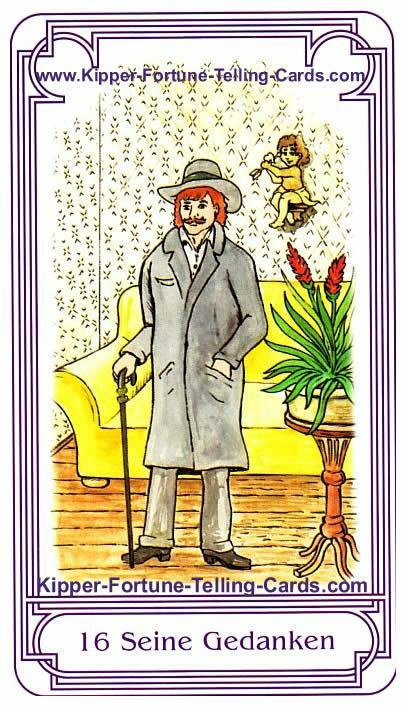 His thoughts is a neutral card, which informs you about your thoughts and future plans. Whether the thoughts are positive or negative, the surrounding cards will show. Think about what is good for you. The exchange with other people can sometimes clarify the thoughts and can let rise fixed plans. Beware of negative thoughts today, if possible. Thoughts are like magic. If black or white, we can decide on ourself. The cardhis thoughts is Neutral so the answer will be not sure. It is not easy to give you a clear answer. You think too much of yourself, so the answer will most likely be no. You only think about you and what is good for you. The communication with other people sometimes can clarify the thoughts.